2-CLIPS peptides are small, highly constrained bicyclic peptides. Affinities in the low to sub-nanomolar range are achievable, while maintaining exquisite selectivities. While they have affinities and specificities comparable to antibodies, they are much smaller in size (1.5–2 kDa) and can be chemically synthesized. Covering a surface area of 500–1000 Å2 , have been shown to address targets not easily tractable with small molecules (e.g. protein-protein interactions). The properties of 2-CLIPS peptides can be readily optimized through chemical modification and addition of functional groups via linkers without affecting target affinity. Thus important characteristics, such as enhanced proteolytic stability or extended half-life can be obtained. Pepscan’s peptide discovery focusses on 2-CLIPS peptides as potential therapeutic drugs. Cornerstone is our proprietary CLIPS technology for the synthesis of highly constrained peptides. This technology is applied to both free peptides in solution as well as to surface-immobilized peptide arrays. 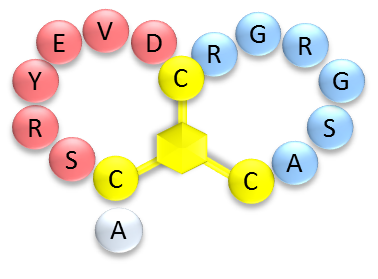 2-CLIPS peptides can be made with various loop sizes or with non-natural amino acids to provide additional diversity to address different targets. ‘2-CLIPS’ peptides are a new class of drugs in an emerging therapeutic space between small molecules and biologics. 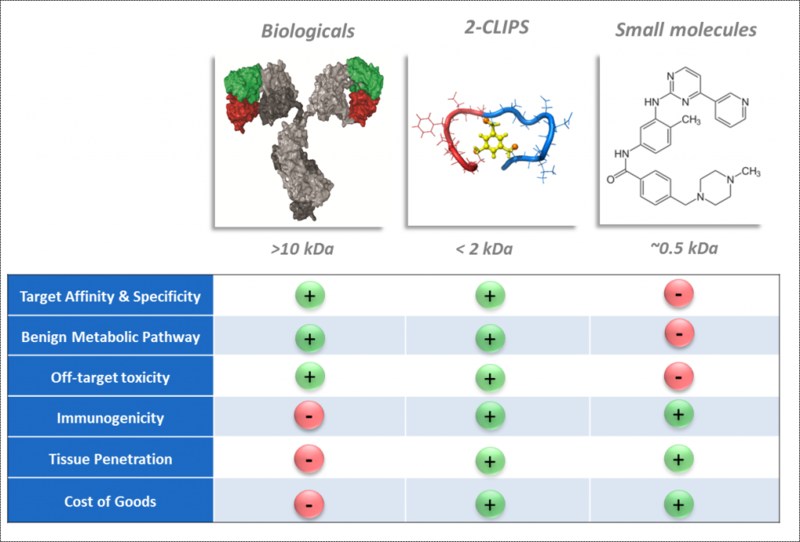 At a fraction of the size of an antibody, 2-CLIPS peptides show comparable affinity and selectivity, but they offer high tissue penetration, and tuneable pharmacokinetics. 2-CLIPS peptides are capable of addressing challenging targets such as protein-protein interactions, phosphatases, and proteases. Some of the unique advantages of 2-CLIPS peptides were demonstrated by Bicycle Therapeutics, which was granted by Pepscan a non-exclusive license for applying 2-CLIPS technology in phage-display libraries. They identified several very potent inhibitors of a/o proteases such as kallikrein (IC50 = 1.7 nM). 2-CLIPS peptides form distinct 1:1-complexes with their target proteins as recently characterized by X-ray crystallography. It has been unequivocally proven now that the 2-CLIPS backbone is truly essential and full functional activity only exists at the ‘2-CLIPS level’. Both ‘halves’ of the kallikrein-inhibitor PK15 only showed activities in the micromolar range or higher. Moreover, the retro-inverso peptide (reversed all-D sequence) does not show any activity at all (IC50>>10 μM), which makes clear that the pharmacophores in PK15 create a unique 3D-environment that is key to its inhibitory activity. In fact, the 2-CLIPS bicycle peptides display antibody-like binding affinities and selectivities, while exhibiting molecular weight characteristics (MW <2 kDa) resembling those of the classical small molecule drugs (MW < 500 Da). The combined 2-CLIPS/HiSense-technology platform of Pepscan offers ample possibilities for discovery of novel, conformationally constrained peptide drugs for a multitude of protein targets. 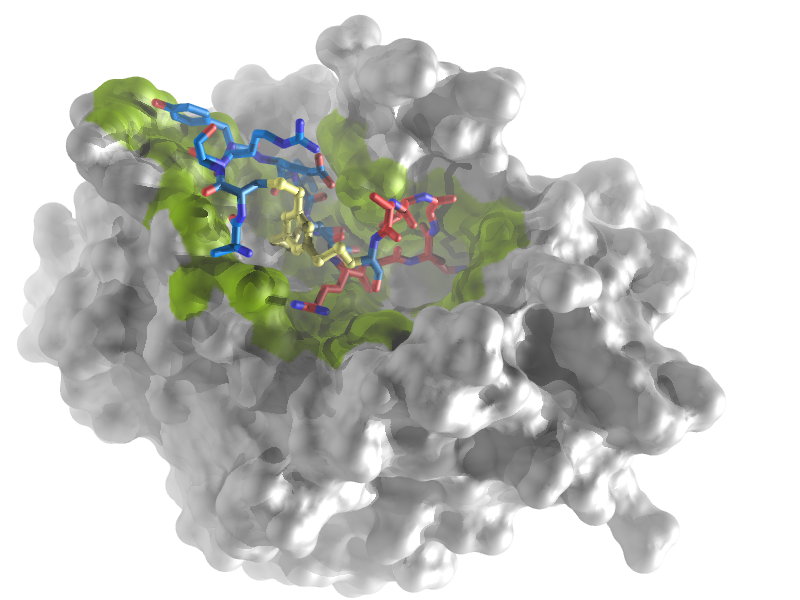 Pepscan is open for collaborations with parties interested to develop potent inhibitors or activators to modulate the function of certain proteins, ideally with strong biology facilities in-house. 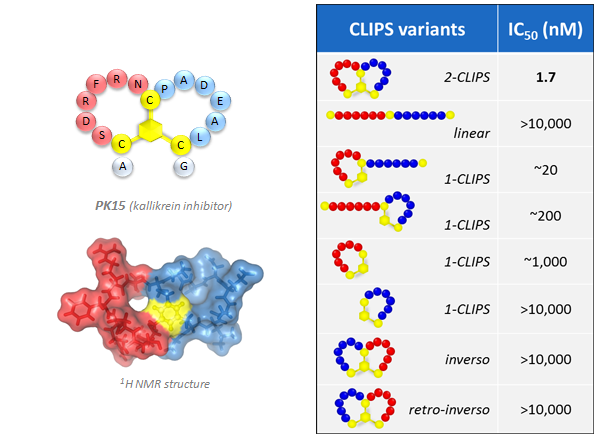 Inhibitory activity of 2-CLIPS inhibitor PK15 and structural variants thereof. The strongly reduced activities of the 1-CLIPS variants (single-loop, linear-loop and loop-linear) emphasize the fact that an intact 2-CLIPS structure is essential for complete activity. 2-CLIPS peptides form a unique class of compounds ideally suited to address the industry’s largest class of biological targets, Protein-Protein Interactions (PPI’s). With their distinctive double loop structure, 2-CLIPS peptides have unique chemical and biological properties to address difficult-to-address drug targets that are known to play key roles in disease processes, yet are currently undruggable with conventional small molecule drugs. ’2-CLIPS peptides’ are a new class of drugs in the emerging therapeutic space between small molecules and biologics, combining advantages of both. There are also interesting opportunities outside the therapeutic area for applying the high-affinity and selectivity binding characteristics of 2-CLIPS, e.g. in the analytical or diagnostics field. For example, developing such molecules for affinity purification of (therapeutic) proteins, e.g. antibodies and in particular fragments thereof, would serve a great need that could improve or even simplify the currently used industrial processes. Pepscan welcomes inquiries of parties interested in using their platform for any of these applications. The 2-CLIPS peptide platform has demonstrated that it is perfectly suited to deliver small molecular weight compounds with antibody-like binding characteristics, and this has created a plethora of interesting applications in different fields.